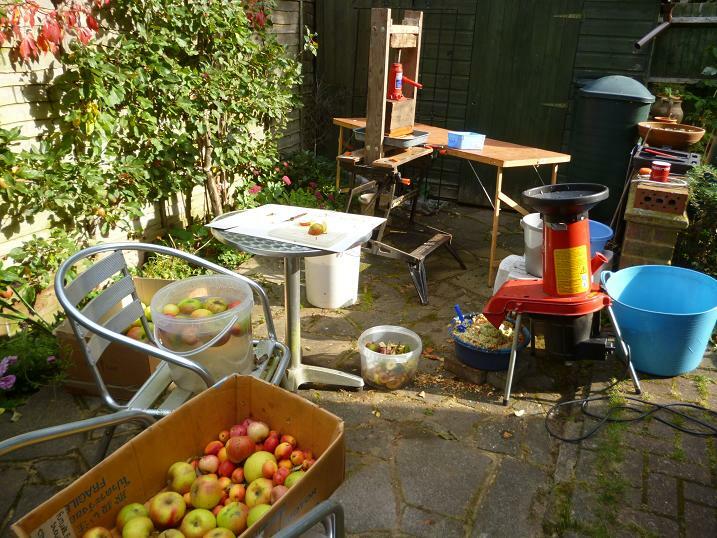 Last year I was overwhelmed with offers of apples for cider making, resulting in two fermentations and a surplus of bottles relative to my consumption, but this year was different story, a cold wet spring and shortage of bees resulting in many bare apple trees this autumn. Of late, a ready supply of Cox’s and Bramley’s, mixed with a third locally gathered sour crab apples, has resulted in a medium dry cider of around 7% alcohol content, that has livened up many a BBQ. As the month of October approached, I was on the lookout for donor trees in the area, following a visit to a farm, where last year the owner was pleading with me to take away bags of apples, while now he had none. I usually make at least 5 gallons of cider a year, which at 20 lb of apples per gallon means a good reliable supply is needed. A wooded bank behind my house had only yielded 25 lb from three different trees varying sour to sweet, way down on expected, the trend continued where ever I looked. My last shot was to return to a green lane close to my old village, which runs through farmland on the way to a long closed schoolhouse, where a variety of feral apple trees have grown amongst the hedgerows, no doubt seeded from domestic apple cores discarded by pupils in days past. As a road to nowhere, the lane has almost returned to nature, kept open by the occasional walker and deer, but for my wife and I, it provided us with an untapped source of apples. The fruit was hard won, brambles having taken over much of the lane since our last visit, but the remembered variety was still there, some almost good enough to grace the supermarket shelf, while others were small, hard and tart, gathering about 40 lb in total. Picking another 10 lb of sweet red Royal Gala from our own trees, we were ready to start. 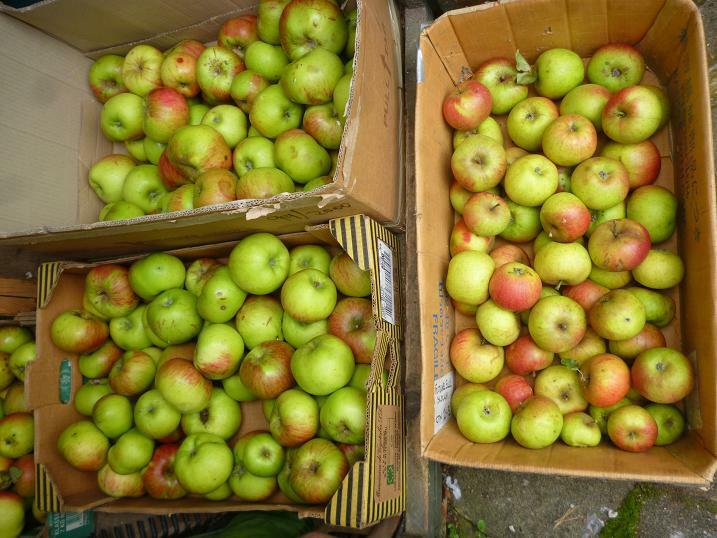 As can be seen from this picture, a wide mix of apples is to be preferred, if actual bitter/sweet cider apples are unavailable. 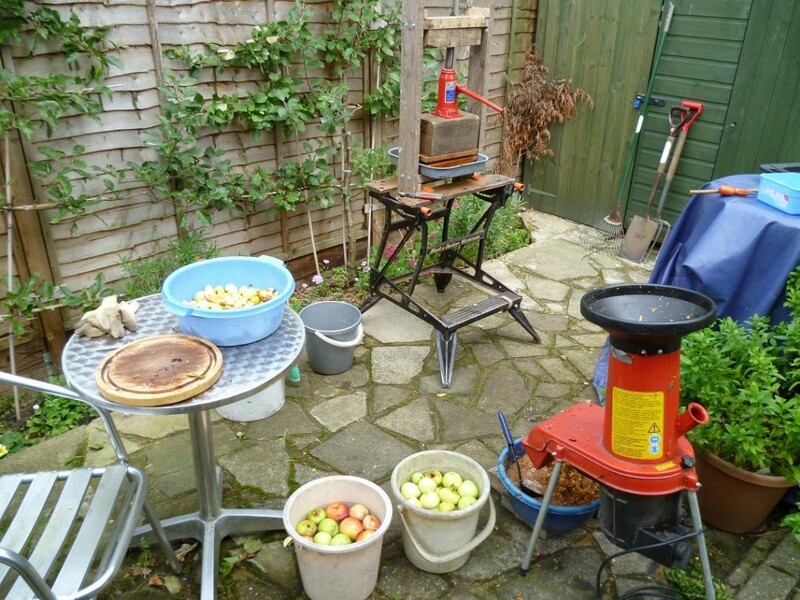 Two vital items needed for cider making are a press and a means of reducing the apples to a pulp. 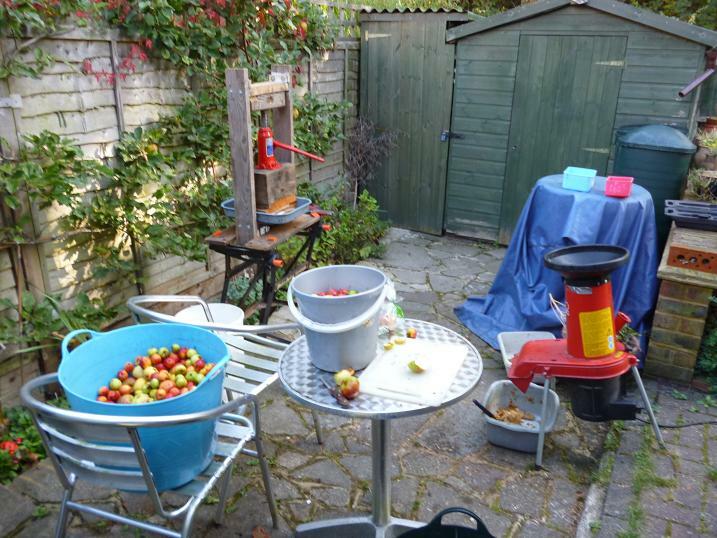 A garden shredder is my pulp provider, while a bolted and glued frame of 4 x 2 inch hard wood provides the basis of the press, a bottle jack from the garage being the crushing power. My wife roughly chops the apples, cutting out any bruising and other nasties, before dropping them in the shredder. The pulp drops into a plastic bowl, which I collect in an ice cream carton lined with a window net mesh, folding the mesh to trap the pulp, then placing the parcel between two plattens of an old pine shelf on the press. The jack pushes the plattens together, forcing the juice out into a stove enameled oven tray, this is then emptied into a six gallon plastic bucket. It is important to use plastic and non-metallic utensils and buckets, as the apple juice is acidic and will introduce corroded elements to the juice otherwise. 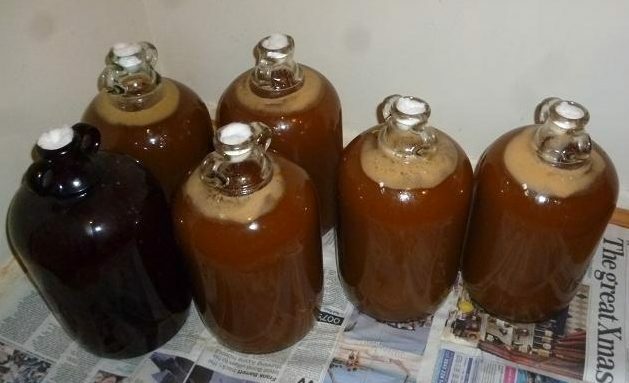 Cider making should be a social event and after four hours, which included cups of tea and lunch, the juice was ready to receive a sachet of cider yeast scattered over the surface, to start the fermentation process. A stir after twenty minutes and the juice was transferred into demijohns, working out exactly at three gallons. Into the top of each demijohn, a swab of cotton wool keeps out unwanted microbes, while allowing the ferment to breath out, as the yeast beings to multiply, causing bubbles to rise to the surface, along with dead, used up yeast, as the sugar is converted to alcohol. The following morning, at the base of these demijohns, the yeast can be seen, while at the neck, the dead yeast is forcing the cotton wool swabs up. As good house keeping, it is OK to remove the swab and hook out the dead yeast with the back of a spoon, replacing the swab with a fresh dry one. The dead yeast will continue to grow for a few days, until the ferment slows down as the sugar is converted. This will be the time to finally clean the neck and put an air lock in place, leaving the demijohns in an out of the way place, that is not too cold, to begin the maturing process. I keep mine in a corner of the kitchen. 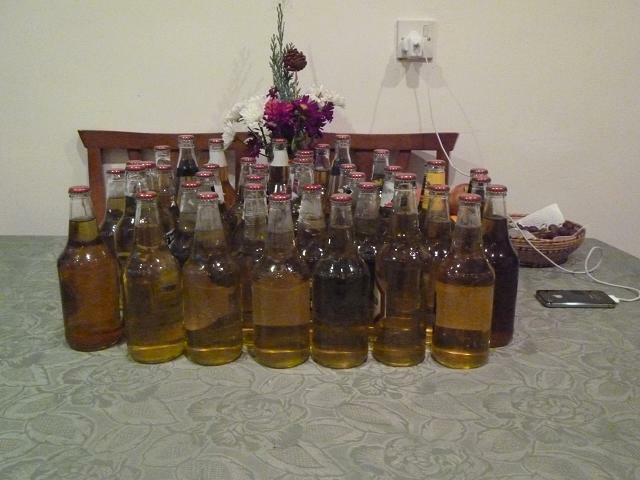 Depending on the cider you wish to produce, there are several phases, that can be followed. The cider can be left as it’s in the demijohns for up six weeks before siphoning (racking) off into a clean demijohn, leaving the lees behind. At this stage the cider should taste sweet and can be left in a cool place to settle and clear, then bottled in strong bottles to mature further. 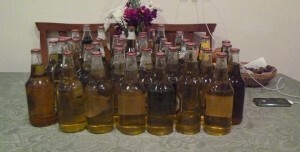 If the cider is too dry at this stage, racking should take place again and sugar syrup added to taste, then bottled. This will produce a still cider of around 5%. 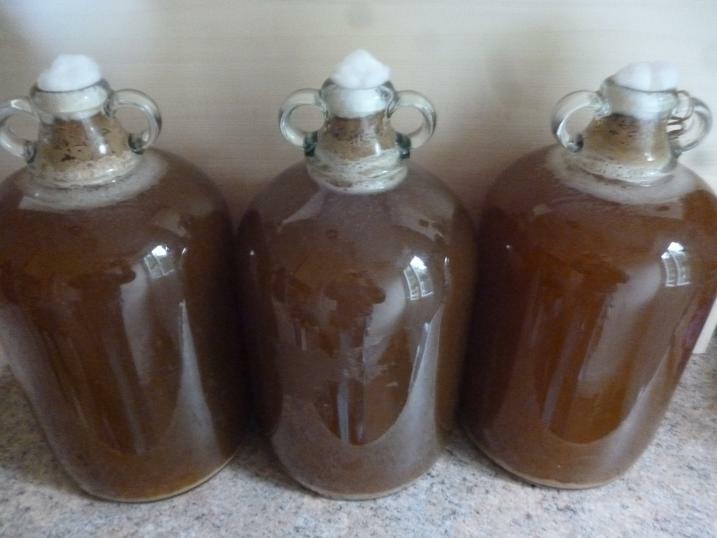 I prefer a slightly sparkling, stronger cider and rack off when the fermentation has almost stopped, after about three weeks, bringing just a squirt of yeast through into a clean demijohn, while adding 4 oz of white sugar dissolved in hot water. The air lock is put back on and the cider will start to gently work again on the sugar, increasing the strength, the cider being slightly hazy. Leave until fermentation stops after another 7 – 10 days, racking for the last time into a clean demijohn, bringing through just a squirt of yeast again. At this stage I taste again, it will be quite dry and tangy. If you prefer dry cider, add one tea spoon of sugar to the pint bottle before filling and capping, sweeter, add two tea spoons. Once capped shake the bottle to mix. If you have a demijohn bung, then you can mix in that, by shaking it before bottling. I use old “Spitfire” beer bottles and have not burst one yet, using a simple capping tool to seal the bottle tops. 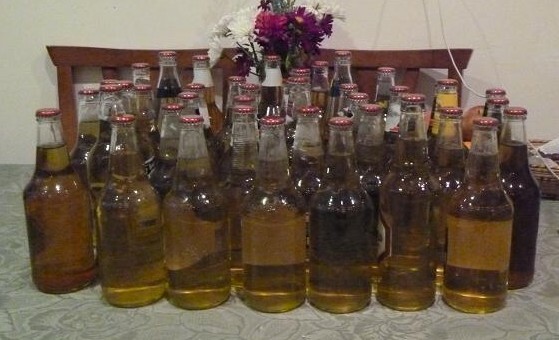 I store my cider on shelves in my garage, where over the winter, the liquid will fine down to a clear golden colour. When the cap is popped, there should be a pleasing hiss and a sign of vapour in the neck. There will be just a trace of lees in the base of the bottle, which should be poured carefully to avoid introducing it into the glass, as it is bitter, wasting about half an inch. The poured cider should be clear with just a hint of effervescence. Enjoy.